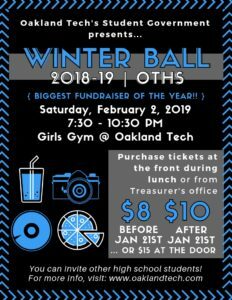 The Oakland Tech Student Government invites all Bulldogs to have a blast at this year’s Winter Ball on Saturday, Feb. 2, from 7:30 to 10:30 PM, in the Girls Gym. There’ll be a DJ, chocolate fountain, photo booth, food, candy and more. Tickets are available in the front of school during lunch or in the Treasurer’s Office. They’re $10/advance, $15/door. We accept cash only. No online orders available, sorry. Only Oakland Tech students and their guests from other high schools may attend. Guests MUST present a valid ticket, student ID, and A GUEST PASS. OTHS students who are inviting guests must make sure the guest form is completed BEFORE they purchase a ticket. Last day to turn in guest passes is Jan. 31. Right here, online! … Or in the Treasurer’s Office. Remember, you must submit a guest pass by Jan. 31 and BEFORE purchasing tickets. Give the completed and signed pass to student government officers in the front of school at lunch or to Ms. Whisenston in the Treasurer’s Office. We’re encouraging people to come in semi-formal attire, but ultimately it’s up to you! Bring yourself, your student ID, your ticket, and some extra cash if you want to buy beverages. We also recommend you bring a bag or purse because we will not have a storage area for your belongings. Your ticket with the barcode can be shown as printed or electronic. Up to you! May I Suggest Song Requests? Absolutely! Please submit your requests here. Upon entering, all attendees must provide their student ID and individual ticket. If students appear to be under the influence of drugs, tobacco or alcohol or suspicious, they are subject to a possible breathalyzer test, bag search, and/or a pat-down. Our SSOs and adult chaperones can deny admission to any attendee who fails to follow school, district, or Winter Ball rules and procedures. Please sign up here to donate decorations, food, candy, plates, cups and more! Thank you in advance for your support!